On the TI Discussion Forum, Eric, a 58 y.o. TI enthusiast from Canada shared that his goal is to complete 1km (1000 meters) of continuous freestyle by year-end. At this point he can swim 1km continuously mixing about 70% crawl with 30% ‘other.’ How can he get to 1km of continuous crawl. The key is to incrementally build the distance you can swim tirelessly rather than just try to build generic — and immeasurable — endurance. I favor two ways of incrementally building the distance you can swim tirelessly. You can follow either to progress, from swimming a single length to a mile or even a marathon. Somewhere between 500m and 1km of continuous swimming, you’ll find the groove where adding more distance becomes fairly easy. Here are my two favored ways to get there. Though I’ve been able to swim a mile since my teens, I’ve used both these approaches, over 40 years later, to build a variety of capabilities in my swimming — i.e. to maintain a stroke count of 14 with a tempo of, say, 1.2 seconds per stroke for more distance while feeling relaxed and nearly effortless. This adds up to 500. Doubling each distance gives you a 1000y/m set. Rest between repeats with a certain number of ‘yoga’ (relaxing/cleansing) breaths. If you can take the same number of yoga breaths between the 75s as you did between 25s that indicates you’ve maintained ease. 2) An ‘interrupted’ longer swim. You interrupt the longer swim whenever you feel your ease, sense of control — or even keenness of focus — breaking down. The interruption can consist of a taking a few yoga breaths at the wall or substituting a length or two of something that feels more restful — or is a less exacting skill. As your balance,stability and streamlining improve, your HR will remain moderate and you’ll need fewer and briefer interruptions along the way. In time, you’ll have progressed to a continuous longer swim. 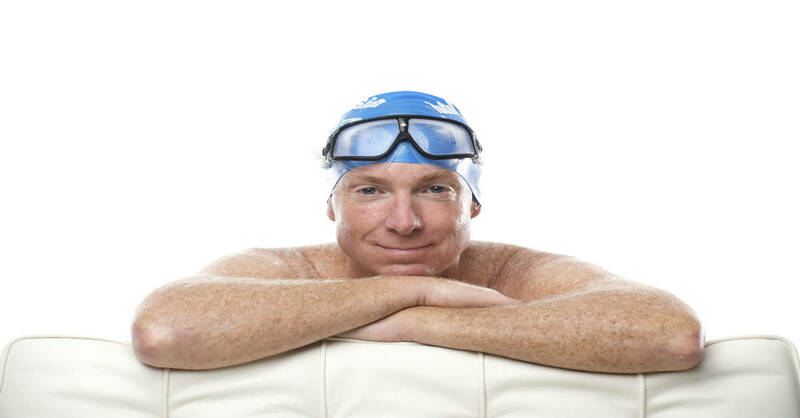 The key principle is that you continue to practice relaxed, smooth swimming. So when you complete your first mile, you feel you could do another! Great drill! I tried it today with the same number of “yoga” breaths between each set (about 10). I rewarded myself with an extra 1×100. Without question, the farthest I’ve swum since I started this journey over a year ago. I’ve found a similar method works in an endless pool. Instead of laps or distance, I use number of strokes: 4×50, 3×75, etc. The key to lengthening distance is to not be in a hurry to get to your goal. Concentrate on each stroke and glide and let the distance covered happen blissfully. 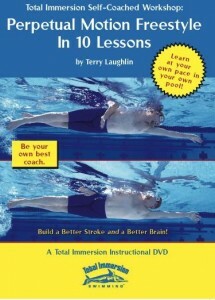 I’m 65 and I gave myself a project to learn swimming a few years ago. I learned freestyle with the TI method and I was told my form is pretty good but I just couldn’t swim beyond one length. I always feel out of breath at the end of one length. It seems that I couldn’t keep my focus or quiet inside. Sometimes when I get distracted in the pool, I find myself at the end of one length without any feeling of being out of breath. Once I felt very relaxed and I swam 4 laps without any problems but I couldn’t repeat it again. Your suggested practice looks too hard for me, any suggestions? Pat, I am 72 and having similar problems with indurance. I take Statins and I am sure they are affecting me somewhat and plan to stop them and see if I improve. Don’t give up hope, I am a “mature” TI learner as well and have faced the same problem. One tip I got which helped was to “breath early” – by that I mean as your right hand spears into the water and your body rotates to the left turn your head with your body to the left as soon as possible and you will be able to commence your breath just as your left arm is about to leave the water – this should maximise the chance to get a controlled intake of air(and vice versa for other side). Remember to start blowing out as soon as you rotate back & turn your head back into the water – don’t hold your breath !